The images began arriving in Joshua Kaufman's inbox. The grainy photos are low-lit and intimate: a man curled up on a couch, sound asleep; the same man propped up against pillows on a bed, shirtless. "People who followed me on Twitter retweeted it. It got picked up by social media and the press. It went super viral," he said. On the same day that he posted his website on Twitter, police came calling. Police on Tuesday arrested a 27-year-old cab driver, Muthanna Aldebashi. 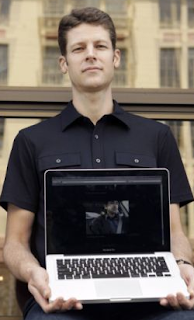 On Wednesday, Kaufman picked up his laptop from the police. CAUGHT ON WEBCAM: An image showing a man later identified as Muthanna Aldebashi, seen via a webcam on a laptop owned by Kaufman. Kaufman had just moved to a new apartment in Oakland when a burglar broke in, taking the laptop, a bag, an electronic book reader, and a bottle of gin on March 21. He activated theft-tracking software he had installed, which began sending photos taken by the computer's built-in camera of the unauthorised user three days later. "I wasn't sure if it would work because I never tested it before," he said. Most of the images "were honestly really boring photos - people staring into the screen. But some were definitely more humorous." Among them was a screenshot of the man logging onto his Gmail account, which showed an email that appeared to include the name of a business, Kaufman said. A quick Internet search revealed it was a cab company in nearby Berkeley, which Kaufman assumed was the man's workplace. Kaufman submitted the information to police, but said they were unwilling to help and didn't respond to numerous follow-up emails. "I know a stolen computer is small in the larger scheme but it would be nice to feel like you actually cared," he tweeted three days after the break-in. Kaufman said he turned to the Internet because he became "frustrated and thought I should try and get some attention from the media." He posted some of the photos, including captions such as "I really don't want to know what this guy is doing with my MacBook" for the image of the shirtless man in bed. Kaufman said he received a call from Oakland police spokeswoman Holly Joshi on the day he included a link to his blog. Joshi said she first heard about the case after receiving calls from media outlets Tuesday. "From that point on, they seemed to be on my side completely," he said of police. "They were apologetic, and they continually told me that they would be doing something about it immediately." Joshi blamed the large volume of theft reports Oakland police receive - about 2,400 a month for three theft investigators - and human oversight for the department's failure to follow up on Kaufman's leads. "It was filed away," Joshi said. "It had leads, so it shouldn't have been filed away." Police arranged a cab ride from Aldebashi and nabbed him when they recognised his face, according to Kaufman. The laptop's return was the culmination of a one-man crusade of online sleuthing, social networking and moments of voyeuristic creepiness aided by the software called Hidden. The software - part LoJack, part nanny cam - is equipped with location positioning software. A representative for the product's London-based developer, Flipcode Ltd, did not immediately respond to emails from The Associated Press on Wednesday. Many portable electronics, including some digital cameras, are now equipped with wireless Internet capability and automatic geographic tagging on any photo taken - a helpful tool when trying to see where a thief has been hanging out. It's a step beyond the LoJack system invented two decades earlier that emitted a signal from a stolen vehicle. Joshi said investigators did not know whether Aldebashi burglarised Kaufman's apartment, noting that stolen merchandise often changes hands.